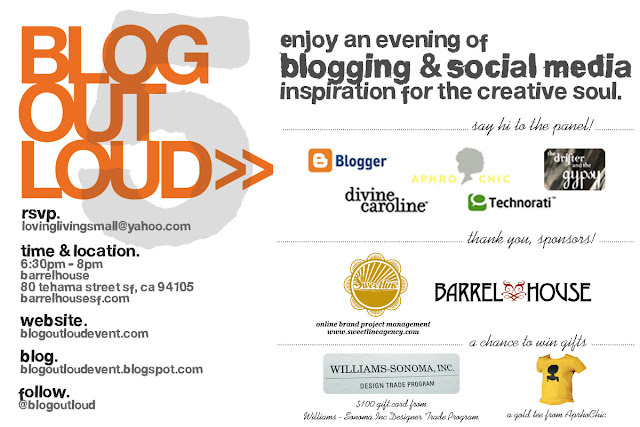 I am excited to announce the details for our 5th Blog Out Loud event on March 4th in my new town - San Francisco!! Blog Out Loud is a free community with offline events for people interested in learning social media and joining the blogosphere. We have a crazy cool panel for this one with people who both embrace blogging and actually shape our blogging experience!! (hi Blogger, Technorati and Real Girls Media!) We are so thrilled and honored that these knowledgeable and nice people will be sharing their stories and thoughts on blogging and social media with our guests. all info is listed on the flyer above or check out our site - Blog Out Loud.